Computer science majors have multiple separate usernames and passwords. These credentials are for the computer science servers Icarus (Linux), Athena (Windows), phpMyAdmin access, and the standard Weber State username and password. Read the following information before requesting a password reset. At the beginning of each semester new computer science majors are automaically given webspaces on the Icarus server. If a student registers after this time they will have to contact a lab aide to have their accounts created manually. Periodically old data is purged when storage on the server becomes sparse. Therefore, students are urged to back-up anything of importance near the end of each semester. The following is a brief list of the major software used by the Computer Science Department. The Computer Science Department partners with Microsoft to provide students access to operating systems (both client and server) as well as development tools used in classes taught in the Computer Science Department. These programs are available for free for students to install on their personal computers. For more information see the Dreamspark tab. It's important to note that you MUST change your password before using any system, especially on the windows systems. NOTE: The usernames and passwords are case sensitive. Click HERE for information regarding Athena terminal server, Icarus server, MSDNAA, etc. For permissions to the Oracle database please talk with the professor of your database class. If you have tried logging in and are still having difficulty with any of your accounts please refer to the contact information at the bottom of the page. Your username will be your W#, including the "w". The username is NOT case sensitive. 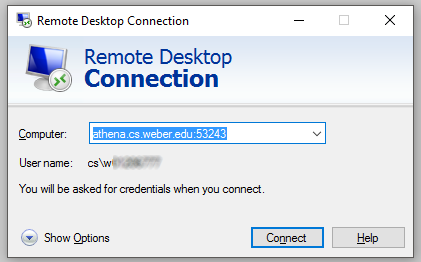 NOTE: There is currently a known compatibility issue with some new versions of Remote Desktop when connecting to Athena. The workaround for this is to put a 'cs\' in front of your W#, If you are still having problems after reading this page use the contact information at the bottom of the page. For all windows remote access, your default password will be the last 4 digits of your W# + cs!. So, if your final 4 numbers were 5483, then your password would be "5483cs!" (Minus the quotes). If your password ever gets reset, this is what the default will always be. IMPORTANT: You will need to log in to Athena or a lab computer and change your default password before you can use anything else. At the beginning of each semester and any time a reset is requested, your password will be reset to the default. When resetting your password it will need to be at least 7 characters long and contain 3 of the 4 character types (upper case letter, lower case letter, number, and special character). The password may not contain your name or w# as any part of it. Your username is your initials (lower case) followed by the last 5 digits of your w#. For example, if your name is John Smith and your w# is w00012345 then your username would be js12345. Your password will be your first name (first letter capitalized) followed by "cs!". For example, if your name is John Smith and your w# is w00012345 your password would be Johncs!. One important thing to take note of here is that the usernames and passwords are created from registration data. Try your full first name instead of short versions, i.e. Kimberly instead of Kim. We highly recommend you change your password by using passwd. Your new password will need to be at least 8 characters long and contain 3 of the 4 character types (upper/lower case letter, number, special character). When entering your password, nothing will show on the screen. This is normal. Just type it in and hit return. Don't try to copy and paste your password. If you are having problems with your account access please read the following information before requesting help. Check your default login, remember you need to change your default password before logging into MSDNAA. If you are still having problems please do one of the following. NOTE: lab aides are not on duty during the summer. Cyberduck is used to help Mac and Windows users drag and drop their files from their local machine onto Icarus (the Linux server). Click "File" and choose "Open Connection"
Password: First name (first letter capitalized) followed by "cs!" Save Password: Only if on a personal computer, DO NOT save passwords on a public computer. Click "Allow" if this pops up. It is just saying that the Icarus certificate is trusted. Files can be dragged and dropped to and from this window (similar to any other directory on a local machine, except files are uploaded/downloaded from the Icarus server). Type 'icarus.cs.weber.edu' or '137.190.19.20' into the Host name box. Saving will prevent the future need to type in the Host Name or IP Address. The first connection attempt will prompt a security alert. Click yes. A prompt will appear to enter a username and password. NOTE: passwords are hidden as they are typed. Icarus allows SSH (Secure Shell command line) access to programs specific to the Linux platform and serves as a web host. A username and password is required to access Icarus. See the Account Info tab to troubleshoot issues regarding credentials. SSH is the most common connection type to Icarus. 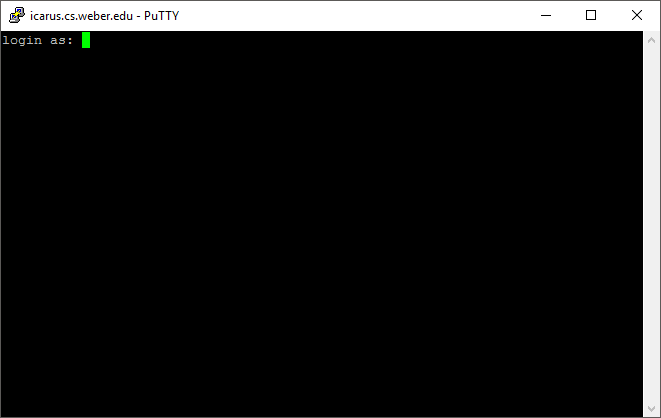 PuTTY is a recommended SSH program for Windows (Linux has SSH built in). The host name for Icarus is icarus.cs.weber.edu and it uses the default SSH port port: 22. For instructions on how to transfer files between Icarus and a local machine, and an explanation of web hosting, see the FTP tab. Athena is the Windows server that allows remote access to all programs that are installed on the lab computers. Students will need to know their Windows username and password to access Athena. NOTE: There is a new issue with Microsoft. Related to network level authentication (NLA). 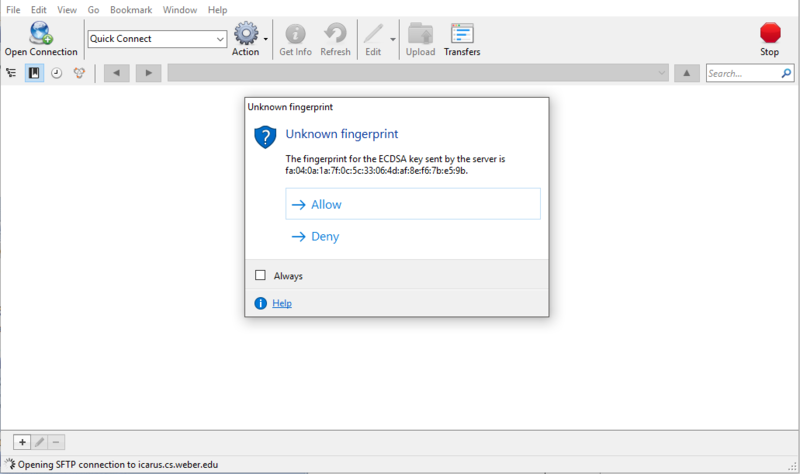 Click on the link to download a remote desktop shortcut that bypasses NLA checking, this will allow you to change your password. 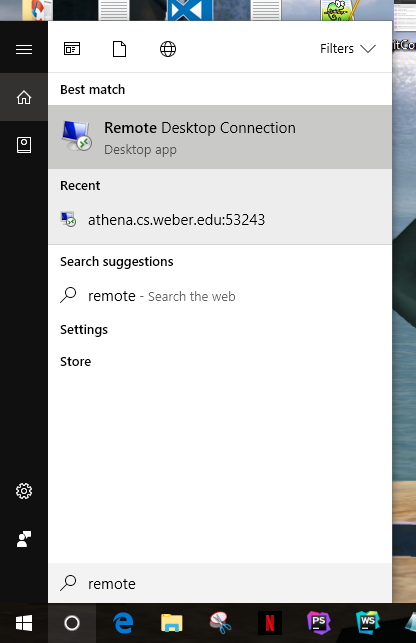 NOTE: There is currently a known compatibility issue with some new versions of Remote Desktop when connecting to Athena. The workaround for this is to prepend 'cs\' to the WNumber used to log in. When done using Athena it is important to log off otherwise the connection will persist and will prevent the user from logging back in for 30 minutes to 4 hours. Because storage on Athena is limited it may be purged at any time without warning (especially at the end of each semester). Please back up assignment and other important data. 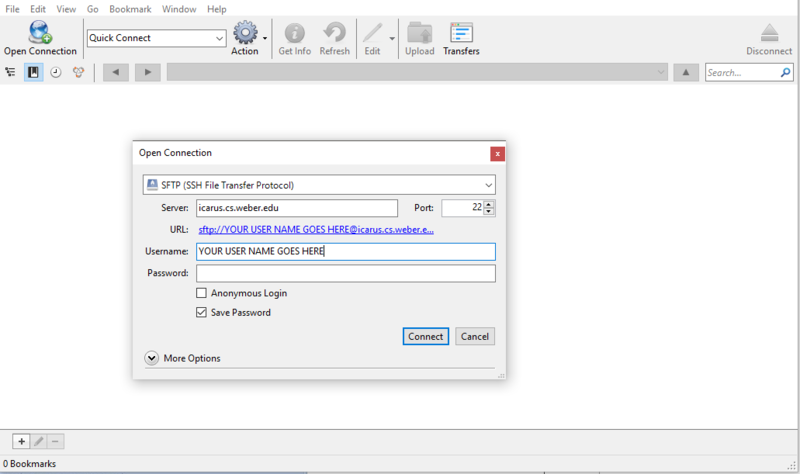 To connect to Osiris (students.cs.weber.edu), it is recommended to use a graphical FTP client like CoreFTP. Be sure to use port 4211, PASV mode, and use Windows login credentials with "cs\" prepended to the username (e.g. "cs\johndoe1"). For help determining log in credentials please refer to the Account Information tab. MySQL is managed via phpMyAdmin. Contact an instructor to gain access to phpMyAdmin. Students must be enrolled in a class that uses MySQL. Password: firstname (capital first letter) with cs! appended. For example: John would use "Johncs!" 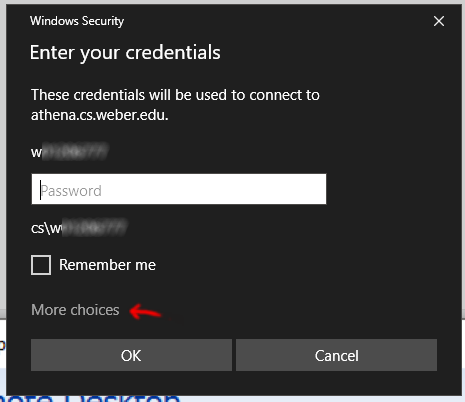 NOTE: You must first login to either one of the windows lab computers or into Athena before logging in. To order software from DreamSpark you must first Log into the ELMS system (see DreamSpark Login tab) then follow the information below. Click on the software tab to the right of the WSU logo. You can see 'boxtops' of a few software titles on the main page. The full list of software is in drop-down list. Select the software package you want by clicking on the image or using the drop-down list and clicking 'Go'. NOTE: if there is a price other than 'Free!' we will not be able to support your purchase. Microsoft activates software you are able to pay for and when purchased all support must go through them. You should now be at the shopping cart, Click 'Check Out'. Make sure you fill out this page, the e-mail address is where Microsoft will send the Key. Click 'Next'. Your order is now finished. You now have a legal license to the software. NOTE: It is a violation of your agreement with Microsoft to use any software downloaded from DreamSpark for any type of financial / business use. To download software from DreamSpark you must have first Ordered Software using the ELMS system, you can then follow the information below. 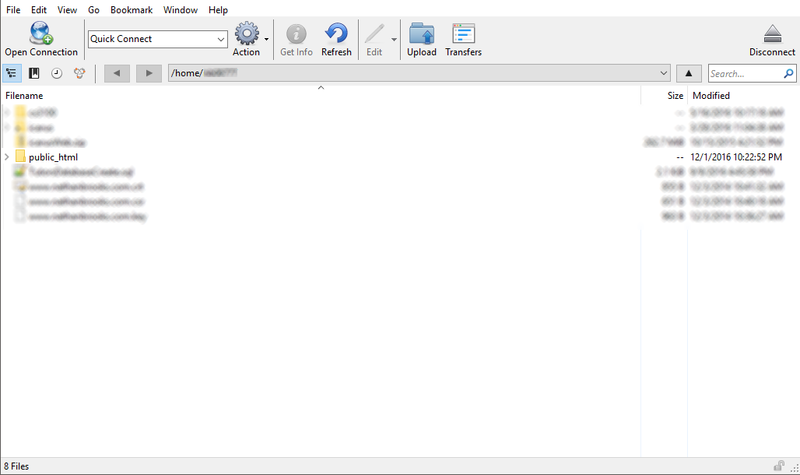 The following is step by step instructions on how to download software through DreamSpark. Click on the 'My software' link on the left side below the WSU logo. You should see the list of your purchased software. Now click 'download' next to the software title you wish to download. Your Product Key/ Serial Number is listed on this screen. NOTE: If no Product Key/ Serial Number is listed, either one is not required or you have used up all your installs. Click the 'Download' Link near the bottom of the page. NOTE: Some programs will take quite a while to download on a slow internet connection. If your connection is too slow to download the file in a reasonable time then you may come into the computer lab on the main campus with a CD/DVD and ask for help in getting the software. 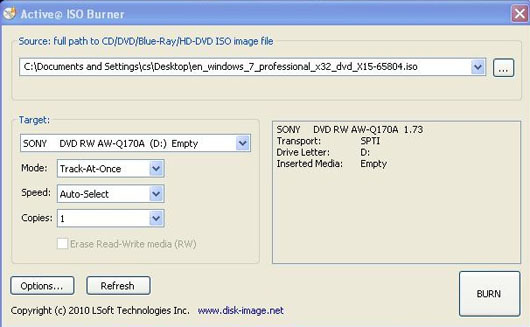 You may find information on burning an iso by clicking the 'Burning Software' link on the left. NOTE:You are only issued one key and one license. You may choose to download the software again if you need to, but you cannot get more than one software key without a very good reason. 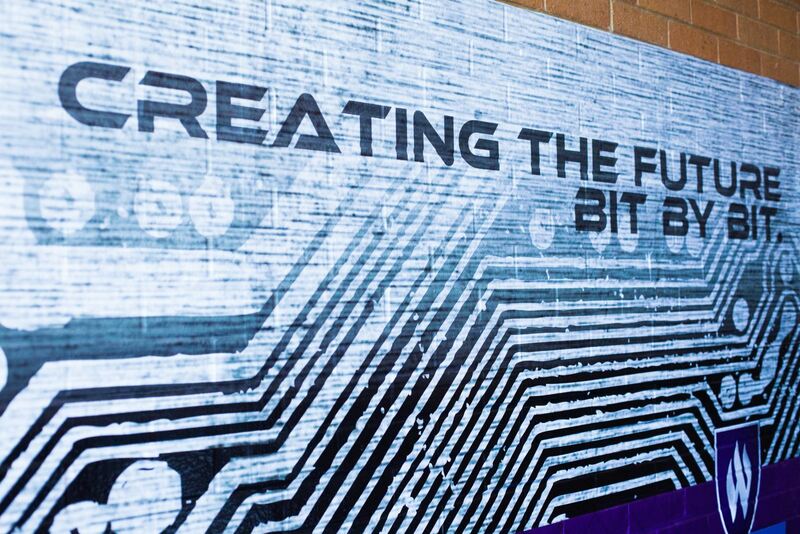 DreamSpark is a partnership between the Computer Science Department at Weber State University, e-academy, and Microsoft. This partnership allows students who are currently enrolled in computer science classes to obtain free licenses to Microsoft's various development software for use in their coursework. Software licenses are provided through the ELMS program. NOTE: It is a violation of the agreement with Microsoft to use any software downloaded from DreamSpark for any type of financial and/or business use. For more information about DreamSpark, see Microsoft's DreamSpark website. Enroll in a Computer Science course during the current semester. Have a Windows account with the Computer Science Department. Have adequate storage for the download. It is recommended to have a fast internet connection. Some of the download sizes are multiple gigabytes. Note that a wireless connection might not be reliable. Login with your WSU eWeber username and password. Follow on screen instructions to finish install. After install if you are presented with a window asking for a server entry use vpn.weber.edu. From the iTunes store download the Cisco AnyConnect application. Tap "Add New VPN Connection..."
Tap "Server Address". Use vpn.weber.edu as the server address. Press ok then done. Tap on the new connection to connect. You will be prompted to enter your eWeber credentials to connect. The Cisco AnyConnect application above will give the best user experience. If the phone is too old to support Cisco AnyConnect use these instructions below. From your iPhone or iPad click this link. When prompted tap the install button. You will be prompted to enter your WSU eWeber user name and password. VPN not supported on all Android devices. You must have Android version 4.0 or greater installed for Cisco AnyConnect to work. Download the Cisco AnyConnect client from Google Play. 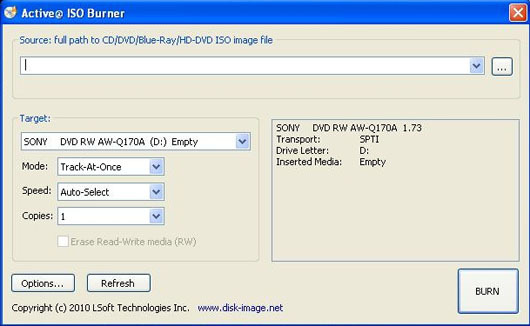 You will need a blank disk (cd or dvd), an iso to burn, a cd or dvd burner, and the burning software. We'll assume you've already downloaded the iso from DreamSpark, have a burner and some blank media but do not have any burning software. We'll use one named Active@ ISO Burner. You can get it from http://download.cnet.com/Active-ISO-Burner/3000-2646_4-10602452.html. Once you've downloaded it, run the program. You'll see a window like this. Click on the "..." button off to the right and select the iso. Lastly, click the Burn button. Allow it to finish, it will take a few minutes for the larger programs. You are now ready to use the disk you just burned. Configuring your Java Path will allow you to run the java compiler from the command prompt. If there is not a folder called jdk with some numbers you need to install the jdk. Click the download JDK button and follow the prompts. From the java folder go to jdk\bin and there should be a java.exe file. You can also click in the address bar and copy the path from there. Right click on "My Computer" and go to properties. In Windows 7 and Windows Vista click "Advanced system settings" on the left. At the bottom click "Environment Variables". In the "System variables" window scroll down and find "Path" and edit it. DO NOT REMOVE ANYTHING FROM "Variable value"! At the beginning of the "Variable value" input box ADD the path you copied in step 5 AND then a semicolon. If you accidentally delete what's in the path hit cancel and return to step 10. OK all the way out to the desktop. Open a command prompt by going to "Start" "Run" and typing 'cmd'. Type in 'java -version' and if it prints out 'java' followed by the version number it worked. If it says "'java' is not recognized as an internal or external command, operable program or batch file." you have a problem, come see a lab aide or your teacher. For users with high DPI (4k) screens, remote desktop windows as well as virtual machine windows will be very small. Microsoft has no solution for this issue yet. However, there is an unsupported workaround. This has been tested by us and it works. You will need to download the enabled registry file and install it. Being a registry item, a restart is required for a change to take effect. Only a single registry entry is added/modified. The 2 means 2x size. If that ends up not being enough for you, feel free to try 3 or whatever value you think will work. The disable file just sets the value to 0 and is otherwise identical. Since this is a registry hack on your local machine we cannot be responsible for results and you are responsible for the results of anything you may try with respect to this. 7:15 a.m. - 5:00 p.m.